What do you do when electricity goes bust on you? You BAKE. Wait. What about the electric mixer? No big deal. Find a recipe that doesn’t need one. I started to get bored waiting for power to be restored in our place when the power hub to which our line is attached broke down. It was daytime and we were counting the hours to the expected lights-on. Oh my, it’s almost five hours. What on earth am I going to do? I have gotten used to always doing something that the thought of wasting five hours being idle sent my mind into frenzy…can’t vacuum the floors, there’s no internet connection, not enough daylight for cross-stitching. What else? What do I have in my refrigerator and cupboards? I got dried cranberries, butter and the basic baking ingredients. 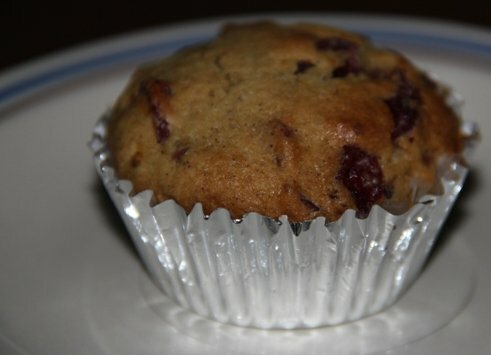 I won’t need an electric mixer for this particular muffin recipe, just a pastry cutter or fork and a mixing spoon. I don’t need much light to measure and mix so off I go to make some orange-cranberry muffins. I love the tangy sweet flavor of orange in any baked recipe, and when combined with the tartness of cranberry, it’s perfect. I made slight changes to this recipe that my aunt gave me years back when I weren’t yet serious about baking. Line with paper or grease a muffin pan. Soak cranberries in the orange juice. Combine flour, sugar, baking powder, baking soda, salt, cinnamon, orange rind and nutmeg in a large bowl. Cut butter into small pieces and cut into dry mixture with a pastry cutter or fork until crumbly. Beat eggs lightly. Remove cranberries from orange juice. Mix eggs, orange juice and vanilla until just blended. Fill each muffin cup 2/3 full. Bake until brown or firm to the touch, approximately 20 mins. 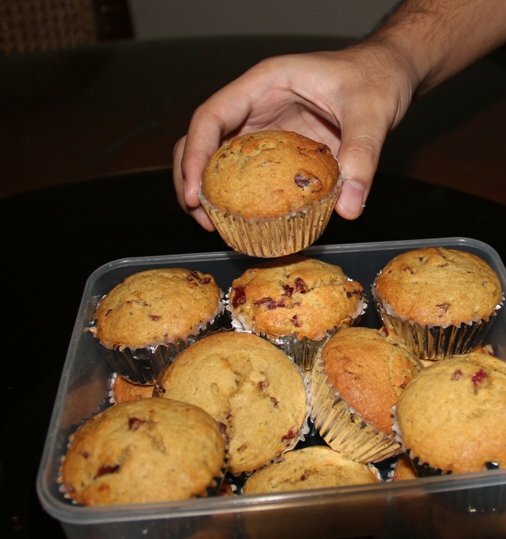 Run a knife on the edge of each muffin cup if not using paper. Cool a bit. This yields approximately 1-1/2 dozen muffins. I only have one muffin pan which can hold a dozen in one batch. I had to get the first batch off as soon as I can hold each piece. I always use paper liners so it makes things quick. It reminds me that I should get another muffin pan. I’d probably get a non-stick one. My youngest son knows I’m baking when I’m in the kitchen hours after lunch. He loves it when I bake. He is always the first one to have a bite of whatever I make. That’s him grabbing his first piece. 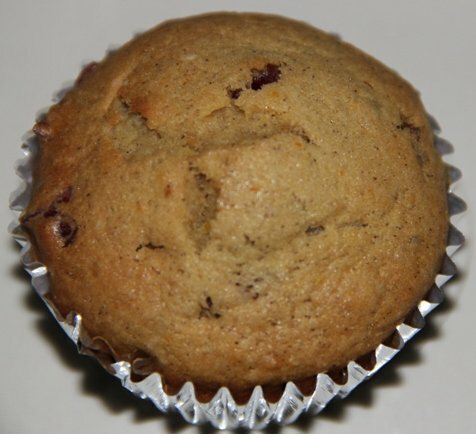 I always like to eat my muffin warm because it tastes fresh. And, I just love the pairing of orange and cranberry. What about throwing chocolate into the mix? I’m a chocolate addict, so I’d happily try anything with chocolate. I promise to make this one.